You're a mean one, Mr Grinch. You're also everything we love about a family Christmas film. How the Grinch Stole Christmas may not be to everyone's taste but it succeeds in telling a fun and unique tale, while spectacularly depicting the eccentric world of Dr Seuss. With Illumination Entertainment’s upcoming adaptation of The Grinch starring Benedict Cumberbatch having recently hit our screens in time for the festive season, Ron Howard’s wonderfully quirky telling of Dr Seuss’ How the Grinch Stole Christmas – released 18 years ago – seems like a fitting Christmas film to revisit. In the town of Whoville embedded inside a snowflake, the Whos are frantically preparing themselves for their favourite time of year, Christmas. Except, there’s someone who doesn’t share quite the same holiday cheer – in the depths of Mount Crumpit lives the mean one, Mr Grinch (Jim Carrey). He’s a green, hairy, abhorrent creature who loathes Christmas and all the Whos who thrive on it. Cindy Lou, a charming little girl hopes to rediscover the true meaning of Christmas by reuniting the Grinch with the residents of Whoville. Through this disastrous reunion we unearth why he has such a disgust for Christmas and why his heart is two sizes too small. Consequently, the Grinch decides to get revenge by sneaking into the homes of Whoville, hoovering up their decorations, their festive food and what he thinks is most important: their presents. Throughout the narrative audiences learn many Christmassy themed lessons such as kindness, love, forgiveness and all of that soppy stuff. One criticism to make is the fact that the very name of the film is How the Grinch Stole Christmas, however this element of the story actually plays very little role in the narrative. Instead the focal point is the Grinch’s backstory which is a perfectly good theme but the title and marketing of the film promises its audience something else, which may be what held it back upon its initial release. The work of Dr Seuss has received many film adaptations over the years and they just keep on coming, illustrating the timeless nature of his work. However, How the Grinch Stole Christmas was actually the first feature length production to be released. Although its critical reception was poor, it proved very popular amongst families, winning ‘Favourite Movie’ at the Kids’ Choice Awards in 2001. This film gets better with age and as the years have rolled by we still see a bit of green on our TV sets during the run up to Christmas. 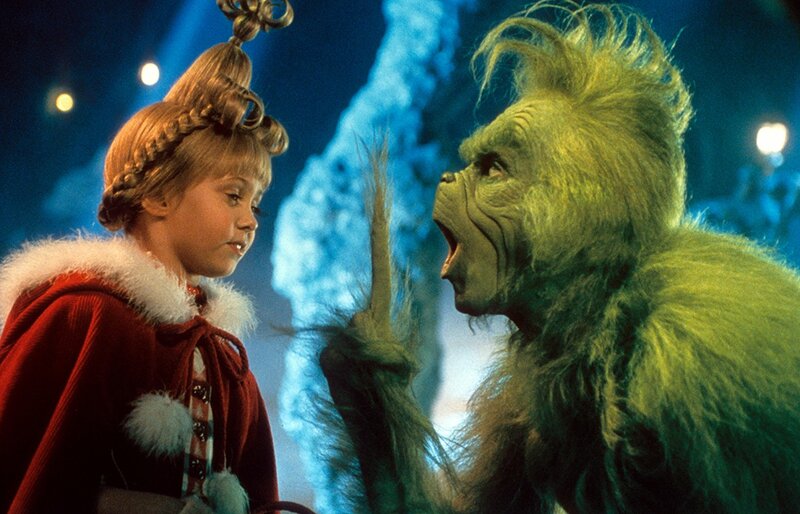 Evidently one of the film’s biggest attractions is the unique and unmistakable talent of Jim Carrey, who portrays the Grinch in a perfect bundle of revulsion and hilarity. This film is guaranteed to make children and grown-ups alike laugh; whether it’s his witty one-liners or goofy demeanour, there’s something for everyone. In this way, Howard fares to make the Grinch a lovable character who we ultimately have sympathy for. The Grinch is also arguably a highly relatable character for many in adult life, his bitterness and anger at the world being something all university students can definitely identify with! The aesthetics of the film certainly communicate the magical world of Dr Seuss with the creative magnitude of the set design and the distinctive costumes. The film won an Academy Award for Best Makeup and was nominated for many other awards regarding mise-en-scene. How the Grinch Stole Christmas is undeniably a one of a kind. Its appearance styled like a children’s pop-up book come to life, accentuated by the fast-paced chaos of the camera movements. However, this may not be to some audience’s taste and the film sometimes has the tendency to overplay the special effects. If you’re looking for a relaxing story to cosy up by the fire to this may not be the one to choose. If you’re looking for a quirky Christmas adventure that will make you laugh and not pull too hard on the heart strings, it’s ideal. Fundamentally, How the Grinch Stole Christmas may be a bit rough around the edges but it encapsulates everything we love about a Christmas movie: it’s funny, it’s feel-good, it’s a bit cliché but most importantly, it’s a classic. How the Grinch Stole Christmas (2000), directed by Ron Howard, is distributed in the UK by Universal Pictures, certificate PG.